Tricorn wanted a slick website which appealed to a discerning client base. We created a simple stones theme which runs throughout the site with grey stones in a variety of positions with one blue stone. The blue stone represents the Tricorn element in the services they offer. We took photographs of the Tricorn Partners in a meeting setting which gives them a very natural look on the site. Michael Schmidt was kind enough to write a testimonial about our creative and web design work for Tricorn Partners. 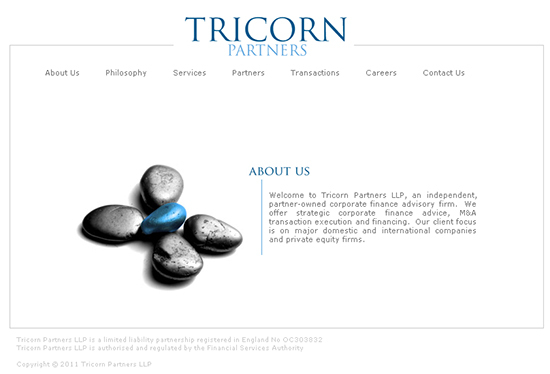 What Happened to Tricorn Partners LLP?